Learn to Troubleshoot Computers and prepare for the A+ Certification online with this Distance Learning Course! CIE's A+ Certification course will train individuals with little or no computer background about computer technology, computer troubleshooting and prepare them to pass the recently updated CompTIA A+ Certification exams. This course will prepare students for CompTIA's CompTIA A+ 220-901 and 220-902 exams. Enhanced learning includes study guides, certification test prep, A+ exam simulations and focus drills that offer students an ideal way to prepare for success as a professional IT support technician and administrator. 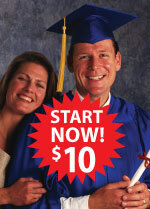 Enroll on-line in Course 2C for only $10 down. The CompTIA A+ Certification is one of the most sought after credentials in the Information Technology industry. 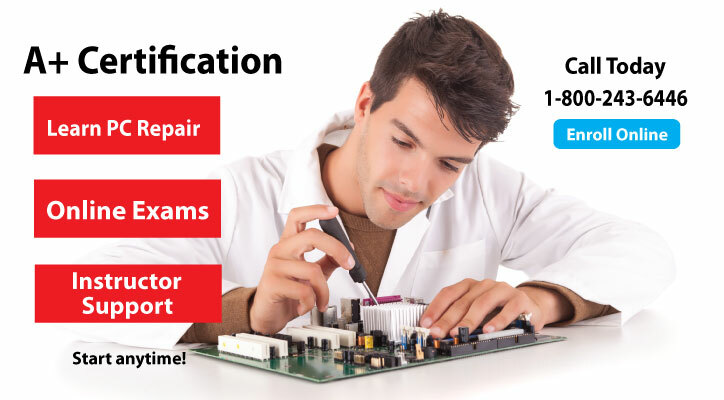 A+ Certification signifies that the certified individual possesses the knowledge and skills essential for a successful entry-level computer service technician, as defined by experts from companies across the industry. The 220-902 exam covers installing and configuring operating systems including Windows, iOS, Android, Apple OS X and Linux. It also addresses security, the fundamentals of cloud computing and operational procedures..
Get A+ Certified and train to become a Computer Support Specialist, Help Desk Technician or Computer Technician. Employment is expected to increase much faster than the average for all occupations as organizations continue to adopt new technology. Demand for Computer Support Specialists is expected to increase because of the rapid pace of improved technology. As computers and software become more complex, support specialists will be needed to provide technical assistance to customers and other users. * Occupational Outlook Handbook - U.S. Department of Labor. This step-by-step course provides a comprehensive introduction to managing and maintaining computer hardware and software. Learn CompTIA+ Exam objectives and prepare for the 220-901 and 220-902 certification exams. Reflects current technology, techniques, and industry standards in the field of PC repair and information technology. Learn to build a complete computer from scratch with this Computer Building Kit and parts kit. 128 page study guide with 14 lessons and experiments.